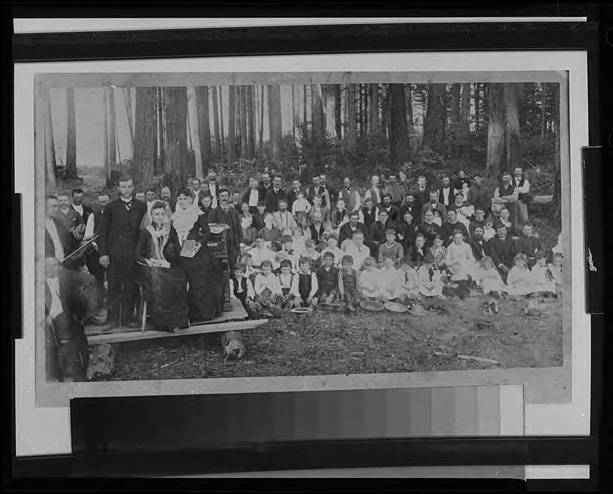 Black and white image of a group of people gathered behind a bride and groom. The bride, wearing a dark, fitted dress that buttons down the front and a lace veil, sits on a chair set up on a temporary platform. Her groom stands behind her, and next to her is a woman wearing a large white lace collar and holding a book. An organ is just visible behind her. A man holding a fiddle and bow sits next to the groom, who wears a three-piece 'sack' style suit. The rest of the crows is seated in orderly rows with the children in front and then couples and then men standing in the very back.